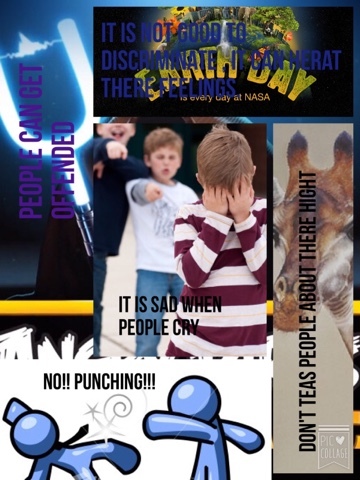 You can see that punching people and making them cry is off limits. How would you like it if someone did it to you? So it would be better if people could be much more nicer than being a bully. If people can understand why it is not nice, people wont get very, very mad like this. We have zero tolerance for discrimination against other people. Some times people can be very nice to one other like giving a helping hand or standing up for someone.